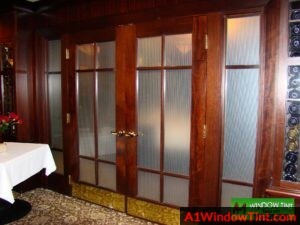 A1 Tint offers a huge choice of decorative window tinting in Kansas City. In addition, our expert staff can help with your decision and our professional installers will successfully complete your job. Decorative window tinting is an artistic and a trendy vibe for Kansas City residents. Whether you’re looking for a way to increase your brand visibility or enhance your interior design, you need the right window tint. Seriously, with the extensive range of decorative film styles, you have the freedom to create the look you love. Here is a quick guide on the most popular decorative window tints in Kansas City. It creates an ambient mood with unlimited design possibilities. With so many options, you can choose from dozens of shades (striped, dotted, and layered) to suit your home and/or office. The decorative tint is either printed or cut out of a frosted film – no need to use expensive patented glass. It’s suitable for kitchen, bathroom and can be removed at a later stage. When the designs are cut, it’s important that you add an application tape to help in the installation process. These add privacy in your home without sacrificing aesthetics. 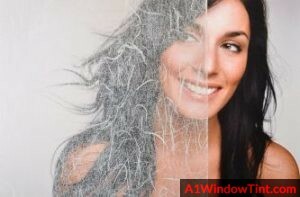 Because the film gives your windows a frosted appearance, they are a contemporary alternative to curtains. Unlike other types of films, frosted window tints are affordable and require very little maintenance. With a variety of shades to choose from, you can be assured of a heightened level of safety. To install the film, you only need simple tools and water. A frosted film is also perfect for open areas that lack privacy like hallways, personal office space, conference rooms, and more. The decorative window film will make your business stand out from the rest. It gives a crisp appearance while making your windows visually engaging. This type of tint is becoming a go-to product for interior designers, architects, and people who love contemporary style. This explains why most businesses use the film to advertise promotions and enhance their storefront. This film is designed for glass walls to obscure digital screens to the outside view. As well, it promotes data privacy in any working environment – you have to see to believe it. Are you curious how decorative window tinting can benefit your Kansas City home or office? Well, the above designs will ensure privacy without sacrificing natural light. They look beautiful in any style of architecture.